Personalized Christmas stocking has red velvet boot and white ribbon, gold snowflake applique and white velvet cuff. 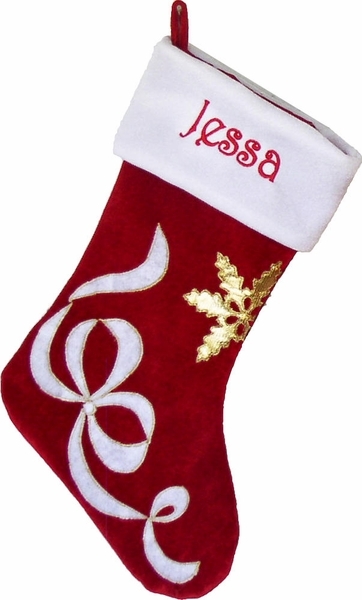 Names can be personalized on the white cuff of this Christmas stocking with Gold metallic or Red metallic embroidery thread to compliment the stocking design and color scheme. We have a sample picture of the stocking monogrammed with red metallic embroidery thread ... click on the thumbnail image in the top right hand corner of this page to see a larger version.